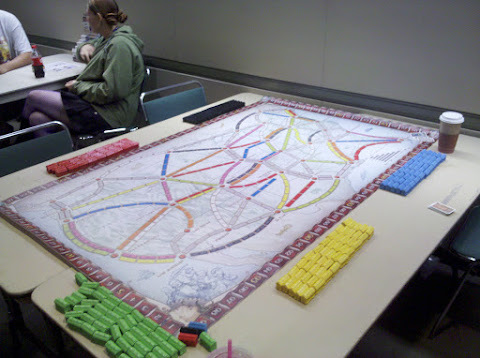 For part two of my look at my PAX 2010 experiences, I’m going to mainly focus on tabletop gaming, and some deeper observations about the convention at a meta level. In stark contrast to the Big Media Sensations of the Expo Hall and its surrounding environs, the tabletop gaming sections were focused, subdued, and full of intense interpersonal connection-driven energy. Everyone was talking to everyone else about the games they were demoing, and it was obvious that most of those doing the shilling were knowledgeable about and affectionate towards their games of choice. This atmosphere of mutual enjoyment was the main reason why I kept finding myself drifting back towards that cramped room on the third floor after each of my progressively-shorter rangings back into the larger fray. I kept seeing the same pleasant faces lit up with the joy of their current game, kept hearing the same awesome voices raised in moments of imaginative excitement. Despite various moments of personal exhaustion and disconnection, the energy in that gaming room kept bringing me back to myself. That was where I wanted to be, in the end, and where I felt I most belonged. In the recent months past, I have teamed up with a collective of like-minded gamers called Cel*Style. One of my big reasons for being at PAX this year was to help promote the Cel*Style concept and current catalog, We partnered up with a Seattle-based gaming store called The Dreaming, who let us promote our games through their own vendor-area booth. I wasn’t expecting much from the endeavor, simply because we hadn;t really advertised the products much there, and few people knew anything at all about the titles. In the end, we sold out of almost every book I brought up there, and I had numerous con-goers tracking me down to find out how they could get more. If anything about PAX lifted my spirits, it was this. I was glad to see Tyler’s still-in-the-making “0 Hunters” game make an appearance, and did my best to wrangle up some interest from a number of passers-by. I got to playtest this back at Gamestorm 2010, and I enjoyed it greatly. I’m still waiting on my test copy, Tyler! Gimme! As a side note, I’m still not 100% sold on the game’s newest name I found the previous name of “Upright Criminals” to be more up-front descriptive about the game’s concepts and focus, but that’s not my call to make. I’m sure there’s a good reason for it in the game’s context, but numbers stuck into product names for reasons I don’t immediately grok always rub me the wrong way. They remind me of those terrible bands with numbers in their names, like Blink 182 and Sum 41 and their ilk. 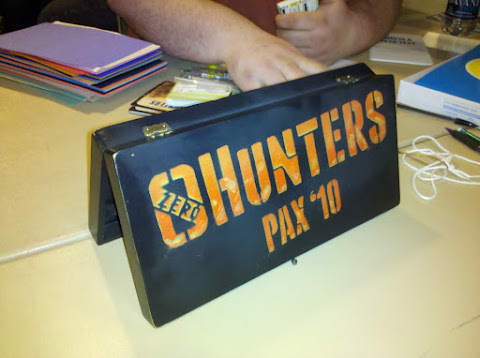 0 Hunters is of course nothing like those bands, but my discomfort with its name makes it difficult for me to then pitch it to others. Still working on getting over that bit. At least one big idea came out of my time on the gaming floors. A previous post of mine covers the subject in greater detail, but in short it’s a combination tabletop-LARP based on convention cosplayers. I’m a big fan of games which incorporate both players and environment directly into the games’ rules and flow, and I am hoping to see this one further. Look forward to more posts on the development of Cosplay Costume Combat/Gaiden! I got to play a short pick-up game of Gun Thief, by Joe McDonald. I found it inspiring, especially in light of my recent design block on my current “big project,” Billions and Billions of Bullets. Gun Thief was great, and I really enjoyed it, but for me the best part of the experience was learning exactly what I didn’t want to do with B3ullets. That realization hit me like a brick to the face, and it was glorious. One of my biggest problems with game design is wanting to do too much with my projects, to make systems and games that present more options than necessary. Having seen and joyed Joe’s game in action, I was able to see a more perfect vision come true, and it greatly assisted my own design mindframe. Awesome. Over the weekend I ate at two places to near-exclusion. The first was Dragonfish, which was convenient enough to be downstairs in the same building as our hotel. While their happy hour specials were fantastically-priced, the primary draw for me was their use of real actual wasabi, as opposed to that fake green horseradish mixture that cheaper sushi places use. The second place was a shining gem of healthiness in a sea of pizza and burgers. Right there on the second floor of the convention center was a placed called Juicy Cafe. They specialized in healthy foods, from veggie bowls to spinach-tofu breakfasts to the most delicious smoothies I’ve ever had, ever. If you find yourself at the Washington Convention Center in Seattle, stop by the Juicy Cafe and get the “Mango Madness” smoothie. You will not be disappointed. I came out of PAX with half a notebook full of new ideas for the improvement of my life. Sure I wrote a lot of notes on ways to enhance my gaming, and I spawned some ideas for new game development projects, but the majority of my notes are on self-improvement. I had something of an existentialist crisis at the convention. At various times I found myself wandering the floors, lost in the chaotic flow, mutually invisible with the mob of nerds with whom I was growing to feel more and more disassociated. There were moments wherein I felt like I might have been depressed, but then instead realized them to more truthfully be moments of epiphanous dissatisfaction. Throughout that ennui-driven haze of identity crisis, I was able to pinpoint things in my life that needed changes, things that needed discarding, and projects that could definitely use improvement. Coming out of those moments was cathartic, and I see good things in the coming days, both personal and creative. I have already touch upon this next bit last year, but this past weekend’s experience really impressed upon me the fact that PAX really isn’t a social event. Despite the crammed-full occupation of the disappointingly-small tabletop gaming rooms, the vast majority of PAX’s mass of attendees go for the media experience – a form of Media which is still quite anti-social. It is true that video games today often promote online-interaction components, and a large number of attendees likely play massively multiplayer games like Lord of the Rings Online and EVE Online, but what many of those people lack are good real-life face-to-face social skills. Despite the increasing emphasis of multiplayer in today’s games, the Video Game Experience is still largely an extremely personal one, and even when it isn’t, most of the inter-personal gaming experiences tend to be intensely competitive, and are often characterized by insults, racial slurs, and sexually derogatory language. When these same players are exposed to each other in person, they shun all interpersonal interactions save those that are most required. They rarely actually talk to other con-goers unless they are asking to take pictures of cosplayers, and even that is usually half-mumbled only loud and coherent enough for the cosplayer to get the basic meaning of the request. Perhaps due to the enormity of their own online personalities, I sense that some con-goers might avoid interaction on purpose, so as not to ruin or expose their digital reputations. All this is just me observing and musing, mind you, but I imagine there’s more than one good sociology thesis to be written on this and related subjects. This is my second year in a row attending PAX, and my second acknowledgement of these same feelings of convention-encouraged anti-social atmospheres. This is quite the opposite from my many experiences at DragonCon, back in Atlanta. DragonCon has always been for me an intensely social event. It’s an experience by, for, and about fans, and those fans make it work on all three levels. Everyone at DragonCon talks to everyone else, be it on the sidewalks, in the registration line, at discussion panels, or at the plethora of room parties after hours. In contrast, PAX attendees rarely communicated with anyone but the Booth hosts, didn’t advertise any social gatherings of parties, and stuck to their little cliques in the waiting lines. While the weekend as a whole has left me with good experiences and fond memories, my hope next year is to return to DragonCon. I said this last year, yes, but I needed to have the hammer strike the nail one more time to truly commit to it. 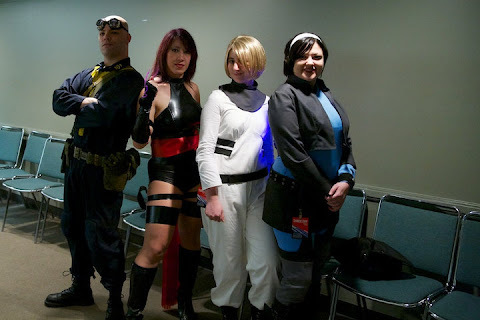 I’ve heard from a few people that DragonCon these days isn’t what it used to be, that it’s less fan-based and more party-based, and it is more heavily mobbed by outsiders and non-fans wanting to gawk at the costumed geeks on parade. I’m okay with that. I’m an odd character, in that while I’m pretty balanced between my need for alone time vs my need for social time, I’m also pretty damn intense on both sides. At PAX this year, I felt like I needed some intense socializing, and what I got was fun but ultimately unfulfilling. I hope Dragoncon can quench that thirst next year. Until then, there are a few other more party- and social-driven cons to attend. I want to give some mad props to the previously-mentioned Joe McDonald, who really rocked a damn fun session of Apocalypse World. I have to tilt my hat to that man for inspiring me in so many exciting ways to amp up my own games. Your on-the-fly MC skills humble me, mate. Another shout-out to Ogre, who needs to come to Portland far more often. I’ve never gotten to actually game with Ogre (and if I have but have forgotten, then I apologize deeply), but every time I cross paths with him at various conventions, we have some awesome conversations. I look forward to our next encounter.